Welcome to another Friday Bloggers Challenge post. This weeks challenge is all about Techniques. I didn't assign any special technique to the players - they were free to pick one of their favorites to use with this weeks post. The images are all from Innovative Stamp Creations - Birch Tree Paintings, which is being released on Monday. The Spectrum Ink I used is Pumpkin Patch (SU retired), I did this on Matte Coated card stock from Marco's Paper. Once dry, my images are stamped in Black Archival. 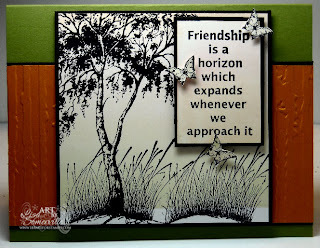 The butterflies on the card were stamped, cut out and placed on dimensionals. Since my the Pumpkin panel on my card was larger then the area of my Cuttlebug Distressed Stripes Folder, I embossed the full plate, then moved my card stock slightly and embossed the rest of the panel. Be sure to stop by the other players blogs to see what they've created- you'll find the link on my sidebar. Thanks for stopping by - have a Happy Easter weekend! This is pretty Lisa, and an interesting technique. TFS! Amazing!! Love that technique and your card is perfect. WOW!! The colors are stunning here, Lisa! I'm sure for you it's like picking a favorite child (or favorite downline....oh wait, that must be me! tee hee!) Love your card...you are the master of the spectrum roll tech! Blessed Good Friday and Happy Easter to you! Beautiful card; love the birch tree and sentiment also and the technique is perfect for it. Very pretty...I know you love that technique! I guessed that you would have done Warhol! lol! Love this card- I wish I could stamp as much as you do, so appreciate all you share- eye candy today- this is a fab card, and I LOVE this stamp set- will have to check it out when we get back from out of town! Have a wonderful, Blessed Easter Lisa. So very pretty, Lisa! Love the spectrum background with this image! Very pretty! Love this technique and you showcase it so well! Happy Easter! Another stunning card and love the spectrum roll technique...I see another Innovative stamps calling my name. So pretty Lisa. Your work with Spectrum Roll is amazing. What a serene card. Very beautiful. Love the background technique and your embossed piece is perfect with the image you used. Stunning color combination.....lovely card! The stamp(s) you used work perfectly for this!! Great card! I like the color combination! Lisa, this card is gorgeous as always. Great job, and great challenge! This is a really cool technique. Wonderful job! What a cool technique!! Great card too!! Of course you rocked this challenge. This card is amazing. Love it.